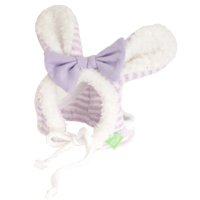 Cute for Easter, Parties or just for fun the Puppy Angel Funny Bunny Bonnet is bound to turn a few heads! Made from supersoft striped fabric the trim and ears are covered in textured fleece. There is a cute bow on the top and white ropes to tie under your dog's chin for fit. There is also two hole at the back of the bonnet for your dog's own ears to pop through.